When the weather turns cooler in the Lowcountry, something shifts. The beach gets quieter. Flip flops are reluctantly replaced with shoes and socks. And mouths start watering for local oysters. You can dine on oysters in restaurants, but your backyard might be the perfect oyster-eating destination. Oyster roasts are a cold-weather staple in the area. Theyre thrown as celebrations, tailgates, or just as a typical weekend dinner. And the most beautiful thing? Oysters are easily prepared to perfection. Here are the steps to roasting oysters for your next roast. While you could harvest your own oysters from the beds around Folly, youre better off visiting Crosbys Fish and Shrimp Market to pick up a bushel or two, depending on the number of guests youll have. A bushel will typically feed between four and six people. Clean your oysters well. Because oysters grow in the mud and sand, youll want to make sure theyre dirt free before you cook them. Start a fire in a barbeque pit or grill with a rack to go over top, and spread the oysters in a single layer over the heat. If you like your oysters steamed, then spread a wet cloth, like a burlap feed sack, over top of the oysters. The moisture will help cook the shells. You can tell the oysters are done when the shells start opening slightly. Pour the hot oysters onto your outdoor table. Thick gloves (think gardening gloves) to handle the sharp shells and oyster shucking knives to pry open stubborn oysters are both necessities. 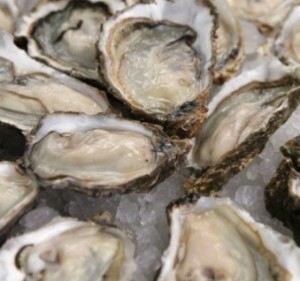 Other than the oysters, youll need some Saltine crackers, cocktail sauce or ketchup, and lemon juice. And it goes without saying that good friends help make any oyster roast perfect. Remember that when youre through, you can recycle your oyster shells at the Battery Island Boat Landing at the end of Sol Legare Road on James Island. Recycled oyster shells mean less erosion and more oysters for future roasts.